On 28th May, 2017 the Central Board of Secondary Education (CBSE) released the results of Class XII for the year 2017. Following this Delhi Education Minister claimed that Delhi government schools had done better than the Private schools. 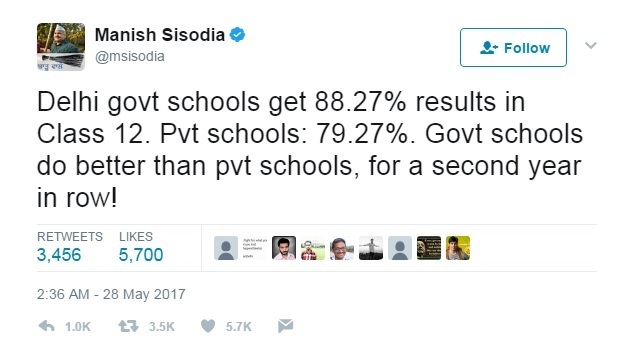 In his tweet, Sisodia claimed that pass percentage in Delhi government schools is 88.27%, while the figure in private schools is 79.27%. 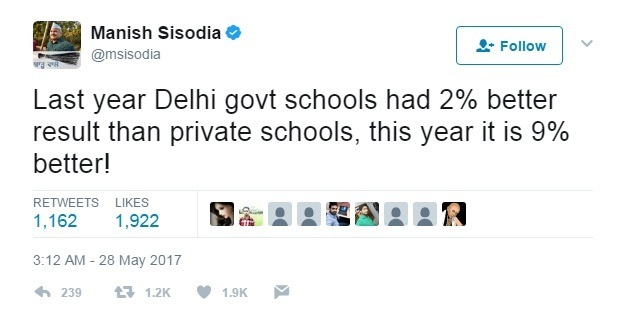 In another tweet, Sisodia also claimed that the gap between Delhi government schools and private schools has jumped from 2% last year to 9% this year. We fact checked his claims. Claim #1 : Delhi govt schools get 88.27% results in Class 12. Pvt schools: 79.27%. Fact-Check Report: Misleading. Sisodia quoted the national figure for private schools rather than Delhi’s private schools. Explanation: As per the press note released by CBSE, in 2017, the pass percentage for Delhi government schools is 88.36%. For Delhi private (Independent) schools, the pass percentage is 84.2%. The figure of 79.27% is the pass percentage of all-India private Schools and not of Delhi private schools. Hence, Sisodia’s claim is misleading. Claim #2 : Last year Delhi govt schools had 2% better result than private schools, this year it is 9% better! Fact-Check Report: False. Delhi government schools did 4.16% better than Private schools this year and not 9%. Explanation: It is true that Delhi government schools had done 2% better than Delhi private schools last year. Pass percentage in 2016 for Delhi government schools was 88.98% and for Private schools it was 86.67%, giving the Delhi government schools a lead of 2.31% (approx 2%). While all-India private schools’ pass percentage for 2017 is 79.27%, it is 84.2% for its Delhi counterparts. Given Delhi government schools pass percentage of 88.36% it would mean a lead of 4% approximately and not 9% as claimed. The readers need to be reminded here that CBSE Board result is not a standardised parameter to measure year-on-year performance. There are multiple factors viz rigor of questions, number of appearing students, etc which affect the passing percentage. Hence, a year-on-year comparison of board results doesn’t factor in the real growth in student learning.